I have recently had a little declutter where I got rid of things that were not for me anymore and bought some products I really wanted to try. So I thought I'd share with you what's new in my skincare. A few weeks ago I picked up a facial scrub from Syahirah skincare. 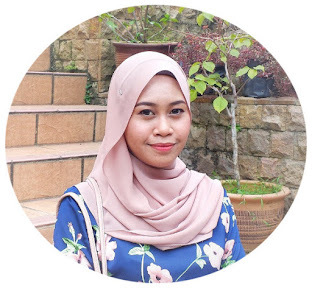 Syahirah is a Malaysian skincare brand that is easily accessible in most Malaysian drugstores. Their products are also free from non-halal ingredients so that's great for their Muslim consumers. Anyway, back to the main point. 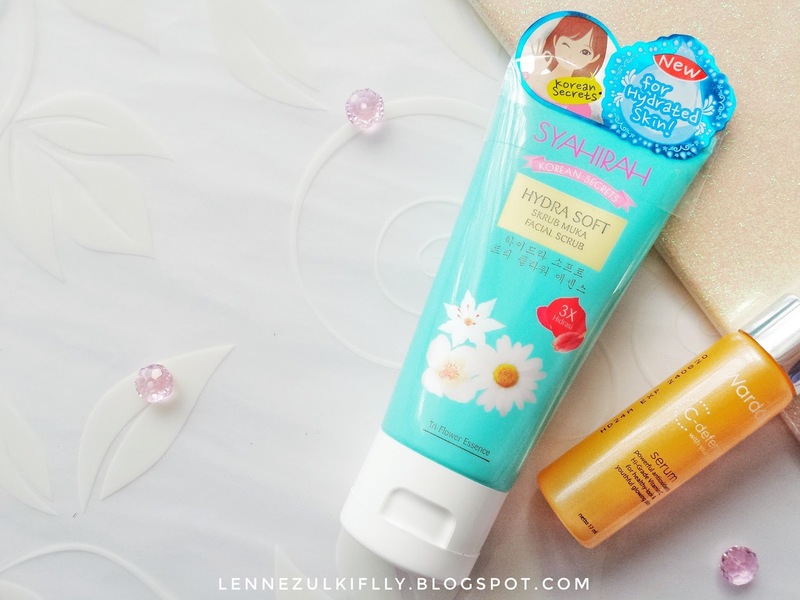 I picked up the Syahirah Korean Secrets Hydra Soft Facial Scrub that retails for about RM13.90 for 100g of product and it also comes in a smaller size containing 50g of product that retails for about RM6.90. The reason why I picked up this scrub was because, well, I ran out of facial scrub of course. Just kidding! I can't help it, it has an attractive packaging but it's not mainly because of that. I was intrigued by the "Korean Secrets" and I love the fact that it's formulated in Korea. 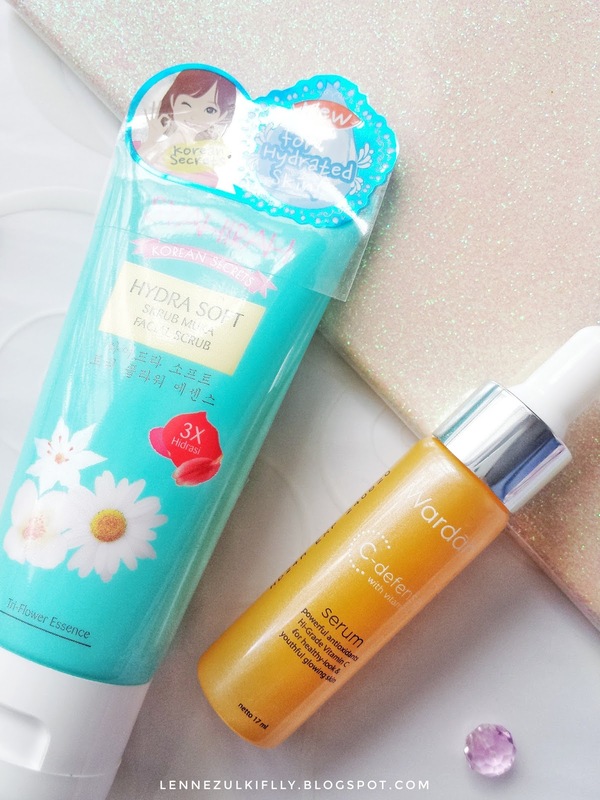 If you don't already know, Korea be real serious with their skincare game and they are not playing around. This scrub has tiny beads which are gentle to the skin. The texture is more less like my previous facial scrub from Organic Aid. It doesn't irritate my skin, it doesn't break me out so far and my skin feels squeaky clean without the tightness feeling afterwards. It's really hydrating, hence the name. Side note, when I look up the ingredients online, it contains metylparaben and propylparaben which something that bothers me. However, that's not the case in the back of the product I bought. I guess they did a new formulation and cancel out the ingredients that would be a concern to some people? I may have to talk to them about this. Anyway, it's a great product and I am enjoying it so far. Apart from that, I also picked up a serum! It's the Wardah C-Defense with Vitamic C Serum. Wardah is also a local brand that just hit the market. They have lots of skincare items and makeup too. I have tried their lipsticks and they're pretty impressive. I thought I would give this one a try because I have read a couple of beauty accounts on Twitter raved about it and is good for oily-skin gal. It retails for about RM32 for 17ml of product, if you're wondering. I am not sure, is it just my brain or this product really just shrunk my "active" pimples? That was one of the immediate thoughts I had after been using it for a day. A day. Now that I have been using it for about a week or so, I can tell that my pimples are lessen, my skin feels smoother and less oily! I think I have found a gem. So, what's new to your skincare? Just bought PURE BEAUTY Pure Beauty White & Bright Day Lotion SPF 20 and White & Bright Night Cream. Maybe because of hormones. I guess.